Bitcoin Gold (BTG) was born on October 24, 2017, when the developers of the coin decided to initiate a hard fork (an update of the network that is not compatible backward) of the Bitcoin (BTC) blockchain. The original goal with the creation of BTG is to decentralize the mining of the cryptocurrency. That is the fastest way to buy Bitcoin Gold in 2019. Bitcoin Gold was born from the idea of opposing ASIC mining chips. As Bitcoin is mined mainly with ASIC mining rigs – expensive, high-performing equipment that is specialized in mining cryptocurrencies -, large mining pools (a group of miners) are dominating the Bitcoin network. Bitcoin Gold developers wanted to change this by implementing an algorithm that is ASIC-resistant – meaning that miners using this kind of equipment are unable to participate in the BTG network. Bitcoin Gold allows GPUs (Graphics Processing Units) exclusively to be used for mining the coin. While Bitcoin Gold is only just over a year old, the cryptocurrency has already rewarded its investors with great returns. 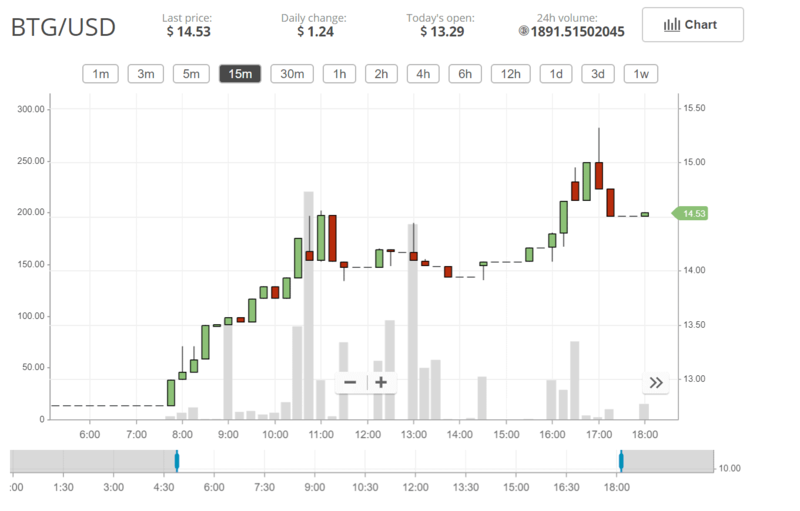 After a few days it was created, BTG was standing at $113. In only two months, the coin’s priced increased to $474, which is more than four times the original price. While Bitcoin Gold is not in the top 10 cryptocurrencies (it’s currently holding the 24th place among the largest coins by market cap), BTG is popular among users with the digital currency trading on over 75 Bitcoin Gold exchanges. 75 services seem like too much to choose from. So now you are asking yourself: where to buy Bitcoin Gold? Let us answer this question by showing you the top BTG exchange services and brokers where you can buy Bitcoin Gold. How to create a Bitcoin Gold wallet? In case you are purchasing BTG on a cryptocurrency exchange and planning to hold the coins for a time, you need to create a Bitcoin Gold wallet where you can safely store your assets. Since its launch, BTG has been widely accepted in the crypto community. Therefore, numerous wallet solutions have been created to store the BTG coins of users. Now, let’s see two of the best ones and how you can use them to create a Bitcoin Gold wallet. The first solution is Exodus, a multi-coin wallet that supports a reasonable number of cryptocurrencies. Fortunately, that includes Bitcoin Gold too. Exodus has a beautiful interface and an easy to use software. To create your BTG wallet on the service, you need to first download the app to your desktop. The second Bitcoin Gold wallet we are showing you today is Coinomi, another multi-asset wallet with one major difference from Exodus – the service is available for smartphones in addition to desktops. There is support for all major operating systems – Android, iOS, Windows, Mac, and Linux included. In addition to BTG, Coinomi supports over 500 digital currencies. To create your Bitcoin Gold wallet at Coinomi, head to the website of the service and download its wallet to your platform of choice. Binance is a well-respected exchange on the Bitcoin Gold market and among cryptocurrency enthusiasts. Founded in 2017, the service managed to become one of the favorite exchanges of crypto users due to its fast registration process, a wide variety of coins, stable service, and the fact that you don’t need to verify your account if you are trading normal amounts of cryptocurrencies. Though Binance lacks fiat deposits and withdrawals, so you have to possess one of the four base currencies in order to buy BTG on the exchange. In its huge list of cryptocurrencies, Binance includes Bitcoin Gold too. So, it’s time to start trading by creating an account, setting up the required security measures, depositing funds, and buying BTG. 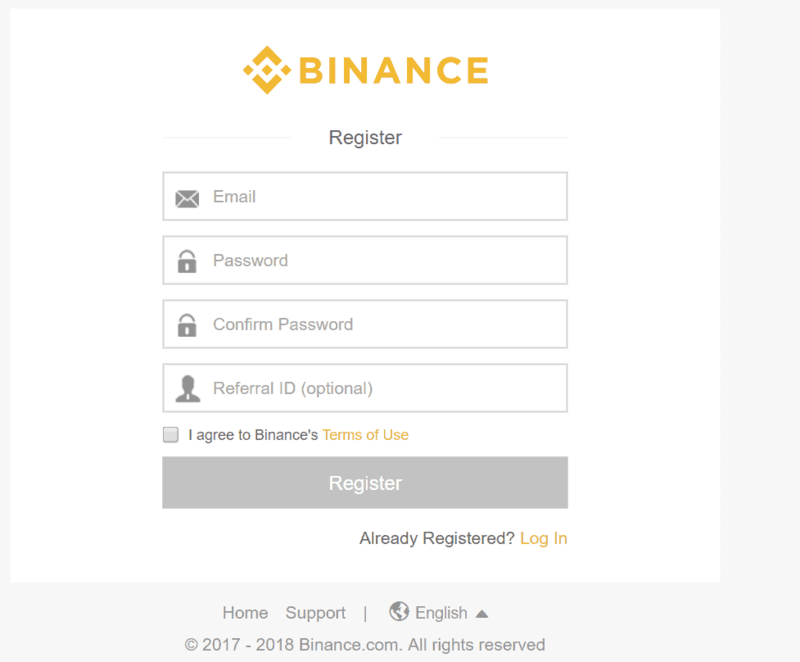 Account registration on Binance is quite fast. Ready your email and a strong, but also easily memorable password, click “Register” on the service’s websites and fill in the form with the required details. When you are ready, check your inbox for an email from Binance to verify your email address. As you are holding cryptocurrency on your Binance wallet, you need to be extra careful about the security of your coins. A great security measure offered by the Bitcoin Gold exchange is 2-factor authentication (2FA). If 2FA is enabled, you will be required to use another device to log in to your account. This adds extra security. In case a hacker acquires your login credentials, he needs access to your device too that you are using for 2FA. 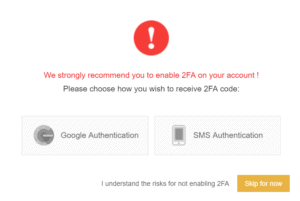 On Binance, you can choose to set up 2-factor authentication either via Google Authenticator or your phone number. To use the first option, download the Google Authenticator app to your mobile device and integrate it with Binance as shown on the exchange’s website. If you choose to set up 2FA via your phone number, you’ll get a text message every time you are trying to log in with a code inside, which you should type into the required field. After your account is secured via 2FA, you are safe to deposit funds to the Bitcoin Gold converter. You can find the “Deposits” tab under the “Funds” menu. Head there and choose from the list of cryptocurrencies. It is advised to select one of the four base currencies on Binance (BNB, USDT, BTC, ETH) as it will allow you direct BTG trades. If you deposit a coin other than the base currencies, it’s no problem either. 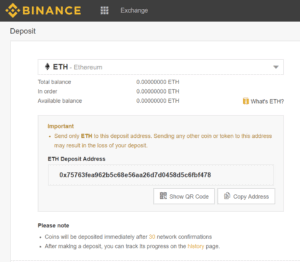 When your funds arrive at your Binance account, convert them to one of the base currencies before buying BTG. Now that you have cryptocurrency on your Binance account let’s start trading. Select BTG from the list of base currencies. On the next page, you will see a chart and different options (limit, market, and stop-limit) to trade Bitcoin Gold. If you don’t know what these mean, let us explain. Limit orders let you set the Bitcoin Gold price you want to trade at. This will allow you to get a good Bitcoin Gold rate, though if you set a too low BTG price, it could take some time until your trade executes. Market orders are the fastest of all three as they execute almost instantly. However, it will not guarantee you the best Bitcoin Gold rate. And last, but not least, stop-limit orders are best suited for short-term trades. With stop-limit orders, you can set a minimal (in case you are buying) Bitcoin Gold price. If the Bitcoin Gold price reaches that value, your trade will execute automatically. Now, choose from either of these options and execute your trade to buy Bitcoin Gold. Changelly is a BTG exchange featuring almost instant transfers. The service is really convenient as you don’t have to provide any personal details except for your email address, and trades usually execute between 10 and 30 minutes. Changelly accepts Bitcoin Gold credit card purchases. However, due to the exchange and its service provider’s fees, Changelly takes a commission of almost 10 percent from your transaction. Good Bitcoin Gold news! You don’t have to verify your account on Changelly for trading normal amounts of coins. Moreover, we can leave the deposit part out completely as the BTG exchange takes the money right from your wallets or cards when buying Bitcoin Gold. Now, let’s continue with our step-by-step guide! Registering an account on Changelly is as easy as 1-2-3. Click “Join” in the top right corner of the page and fill in the details with your details. 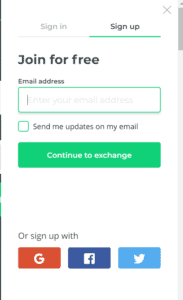 Similarly as Binance, you’ll only need your email to register on Changelly. For a faster process, you can use Google+, Facebook, or Twitter. As with most accounts you create on the internet, you have to verify your email address after signing up. Check your inbox for a message from Changelly and click the link inside to verify your email. As security is super important when you are using any kind of platform that offers trading services, you should take some measures yourself to protect your account. 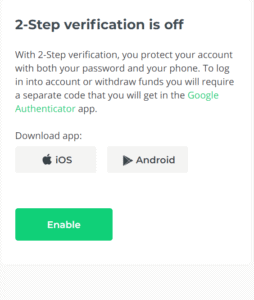 Head to the “Settings” tab in your newly created Changelly account and check out 2FA. 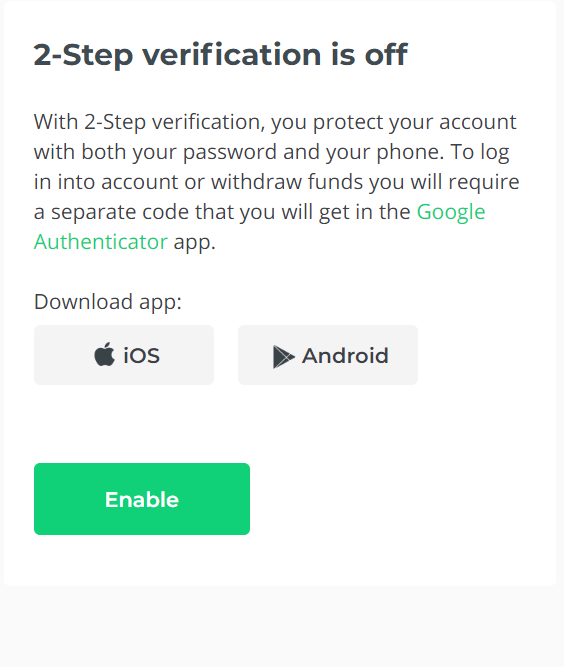 You have to download Google Authenticator to your smartphone to activate 2-factor authentication – you can find the link for both iOS and Android on the 2FA page. As you don’t have to deposit funds to Changelly, we can continue with buying Bitcoin Gold. Head to the homepage of the service and select the currency you want to use to buy BTG as well as Bitcoin Gold from the list. Choose how much coins you want to purchase and proceed to the next page. If you are using your credit card to buy Bitcoin Gold, fill in the form to execute the trade. Your BTG should arrive between 10 and 30 minutes. CEX.IO is one of the oldest cryptocurrency exchanges. The Bitcoin Gold exchange was founded in 2013 in London, the UK. At the time, the operators of the service were also running a cloud mining solution – that, at a point, got so large that it possessed 42% of the total hash rate of the network. 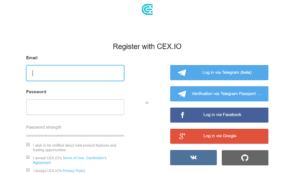 CEX.IO features a BTG exchange and trading platform that is fairly easy to use. The exchange accepts credit card payments with reasonable rates (2.99%). Now, let’s see how to buy BTG on CEX.IO. 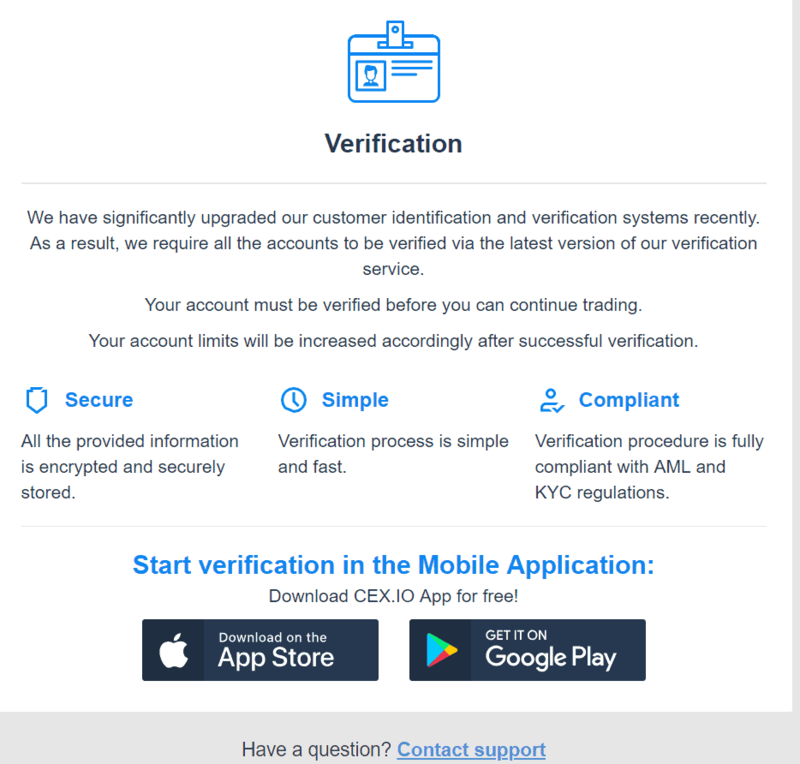 Unlike the previous cryptocurrency exchanges, CEX requests you to verify your identity before you can start trading on the platform. Therefore, we’ve included that in a separate step. 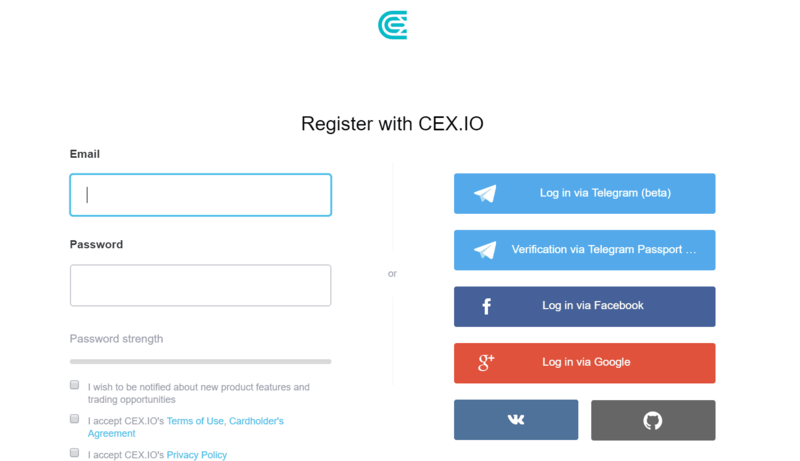 Head to the “Register” tab on CEX.IO and continue with filling in your details. The service offers plenty of alternative registration methods, which will make your user experience better and your account creation faster. You can choose from Google+, Telegram (you can also use the Telegram Passport to verify your identity), Facebook, VK, and GitHub. After you are done, proceed to the next step. 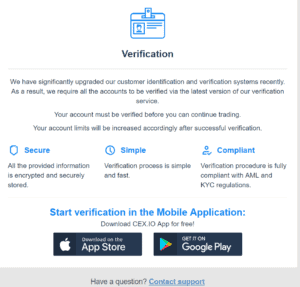 Now, that your account has been created, you need to verify it in order to start trading. To do that, you need to download the CEX mobile app to either iOS or Android. The verification part can become tricky as we were unable to log in via third-party services (such as Google+) from phone, so we needed to create another account without using Google+. If you manage to log in to your account on your smartphone too, you can start verifying your identity. CEX will ask you to take a photo of the front and back of either your government ID, driver’s license, or passport. After that, you have to make a note stating that you are a CEX.IO customer. Then, you need to make a selfie with the note and your identity document in your hands (which can also be a bit tricky to do). The next step is to deposit funds to your account. Head to the “Deposit” tab and select between the different payment methods (credit card, bank transfer or CryptoCapital). While credit card payments are more expensive, they take less time to arrive. After you are done selecting your payment method, proceed by selecting the amount of funds you want to transfer. As soon as your funds have arrived on your account, you can start trading. Head to the “Trade” tab and find the Bitcoin Gold USD (BTG/USD) pair. To exchange BTG to USD, select the amount of Bitcoin Gold you want to purchase. Please note that, like Binance, CEX’s trading platform has different order types. As you now know what limit and market orders are (if don’t, head back to step 4 of the Binance guide), we won’t explain those. The third option, margin trading, is not available for BTG, so you can leave that out. If you prefer a good Bitcoin Gold exchange rate, go for the limit order, in case you want to execute the trade as fast as possible, choose the market order. eToro cryptocurrency’s platform is one of the best out there to buy digital assets. 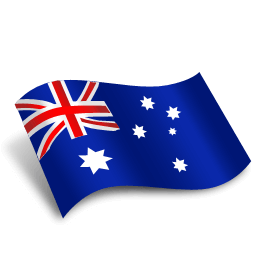 This broker, being regulated in multiple countries including the UK and Australia, offers outright coin trading for its customers. It means that you are the real owner of the digital currency you are trading on the platform – as opposed to the earlier cryptocurrency offerings of the service which were based on CFDs. eToro is a smart, easy to use, newbie-friendly platform that has awesome social trading features (like copy trading). 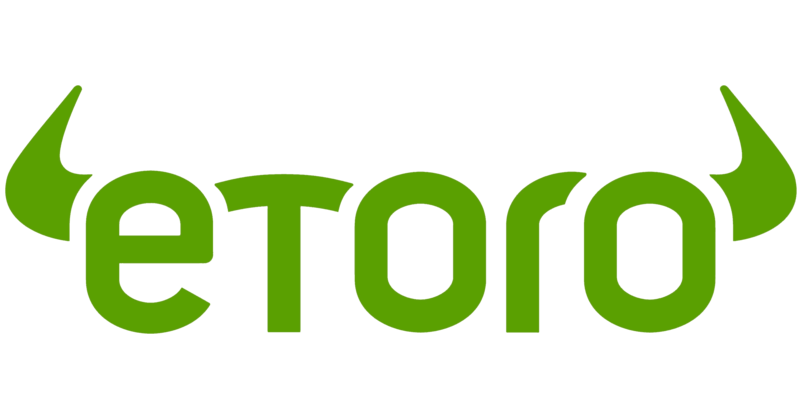 eToro would be a great platform to buy Bitcoin Gold. But unfortunately, the service does not support Bitcoin Gold in any form. Coinbase is a San Francisco-based cryptocurrency exchange that has served millions of customers. The service is one of the most newbie and beginner-friendly exchanges in the crypto space – you can purchase your first coin with a few clicks using the user-friendly interface of Coinbase. The crypto exchange supports credit card payments with one of the lowest fees on the market. Therefore, if you choose this option to buy cryptocurrency, you don’t need to deposit funds into your account. Instead, you can go right ahead to buy your coin of choice. However, a major downside of Coinbase is in its support for coins. The exchange trades only a handful of digital currencies, and, unfortunately, Bitcoin Gold is not one of them. Plus500 is an Israel-based broker that offers CFD trading for multiple assets, including stocks, forex, and cryptocurrencies. Similarly to eToro, this service is regulated in multiple countries, including top-tier regulators, such as the UK’s FCA. In addition to that, Plus500 is traded on the main market of the London Stock Exchange. Due to the aforementioned fact, the broker has to comply with different regulations and laws. Therefore, its service has to be more transparent and fair than competitors that are not traded on a stock exchange. As cryptocurrencies are offered as CFDs on the broker’s service, there’s no need for users to hold their coins on crypto wallets. However, you are not the actual owner of the digital currency you trade on the platform. And CFD trading is considered as a high-risk activity, so you should be careful with your trades. Unfortunately, Plus500 only supports a limited number of coins and Bitcoin Gold is not among the supported digital currencies. Read back to see our step-by-step guides on services that support BTG. 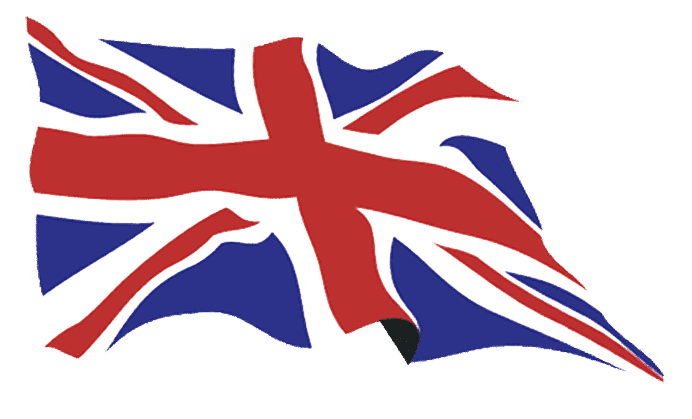 Bitcoin Gold becomes more and more popular in most countries, including the United Kingdom. Therefore, plenty of cryptocurrency exchanges and brokers are supporting the digital currency. While this is a great thing, there is also a downside. And that is confusion. It can become a struggle to find the best Bitcoin Gold wallet for UK citizens from so many solutions that have been deployed. But here we are to help you! Testing numerous services, we have come to the conclusion that Binance is the best platform to buy BTG for the citizens of the United Kingdom. The crypto exchange has very low fees and relatively high account limits, so you don’t have to verify your account if you are trading normal amounts of coins. To buy Bitcoin Gold in the UK via Binance, check back to read our step-by-step guide on the cryptocurrency exchange. Both Canadians and Americans are interested in buying Bitcoin Gold. While there are many services where you can buy BTG, due to the strict regulations of the USA and Canada, many of the crypto exchanges are denying support for citizens of the aforementioned countries. But let us help you in showing the way to buy Bitcoin Gold in the USA and Canada. Fortunately, Changelly is not among the services that are denying support for Canadian and US users. This cryptocurrency exchange just accepts everyone from the Earth as their customer. 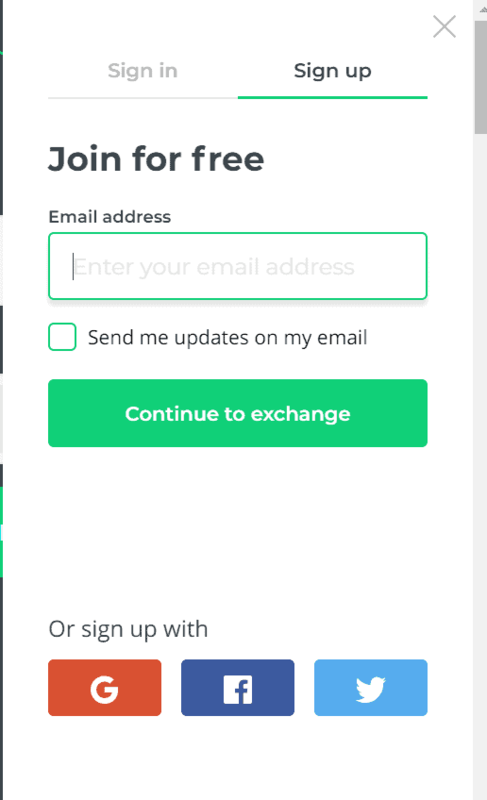 Creating an account is easy at Changelly, you only need an email address. The best feature of the cryptocurrency exchange is its near-instant nature; your funds will be credited within 30 minutes after the transaction has been initiated. While Aussies are interested in buying BTG, many services are focused mainly on Europe and North America. So, we need to find you the best cryptocurrency exchange where you can buy Bitcoin Gold in Australia. And that service is Binance where the Oceanic nation is one of the supported countries. The exchange features a wide variety of digital currencies, high account limits, and inexpensive trading fees. To see detailed steps on how to use the service to buy BTG, read back to find our tutorial. While “manual” trading – where you are using different indicators to deploy your own technical analysis in addition to fundamental analysis – need certain expertise from users, automated trading solutions do not have such requirements. Instead of manual analysis, the aforementioned applications use algorithm-based robots that are scouring the market to make potential profits fully automatically. These services have been present on the fiat market for a time, and have been implemented into cryptocurrencies – such as Bitcoin Gold – as coins have become increasingly popular. The main benefit of Bitcoin Gold trading robots is time. As opposed to manual trading, you don’t need to sit in front of your computer screen all day to determine the best entry and exit points for your trades. You just simply have to set up the robots that will use algorithms to find those points for you. Therefore, you are making potential profits fully automatically, without the need to continuously interact with the assets you are trading. The only thing you have to do is monitor the performance of the bots. Furthermore, most crypto robot platforms use their own strategies and indicators to find the best trades, so you don’t need any trading skills to use such an application. To trade Bitcoin Gold with a trading robot, you need to first find the service of your choice. We have a page dedicated to crypto robot platforms, which might be worth for you to check out. After you have created an account at a service, you need to deposit funds into your account, set up your bots, and they will do all the trading for you. You own the Bitcoin Gold, you have the right to move it, sell it, and transfer it as you wish. 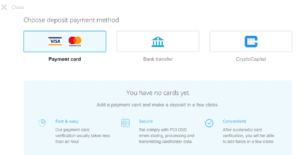 Credit card transfers are really convenient, especially when buying cryptocurrencies. 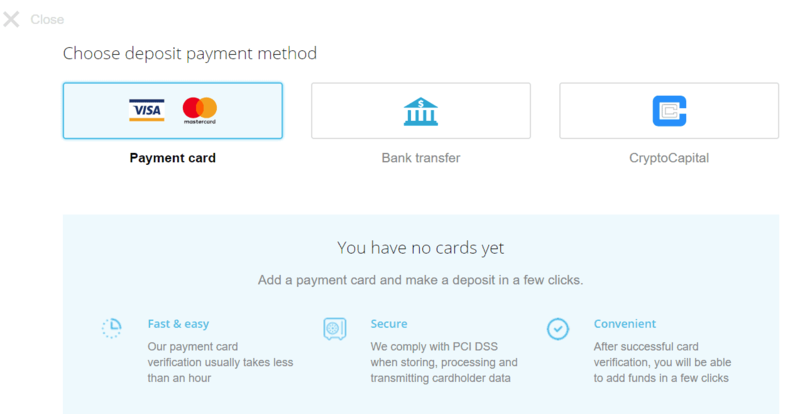 While bank transfers take multiple days to arrive and you have to wait until the weekend is over for financial institutions to resume transferring your funds, card payments allow for almost instant transactions. However, credit card crypto purchases are more expensive than bank transfers. The latter cost only a few percents or none at all, while credit card fees can go as high as 10 percent. So, you have to carefully check which provider to use. As Bitcoin Gold is not as widely adopted as Bitcoin (BTC), you have limited options for credit card purchases. If you want to use a BTG exchange, CEX.IO offers the best rate (2.99% officially, but some users say it adds up to 8% with hidden fees) for that. On the flip side, in case you don’t want a wallet for Bitcoin Gold trading, check out brokers, such as IQ Option. On IQ Option, deposits are free, so you just need to deposit fiat via a credit card to your account, then use your balance to buy Bitcoin Gold. We have screened the internet as well as the brokers and exchanges offering BTG trading, and we couldn’t find a solution to buy Bitcoin Gold with PayPal. It seems that the brokers and exchanges are either not supporting PayPal as a payment method or BTG is not offered for trading on the services. So, unfortunately, you are unable to exchange Bitcoin Gold to PayPal balance. You don’t need to use fiat currencies to buy BTG. 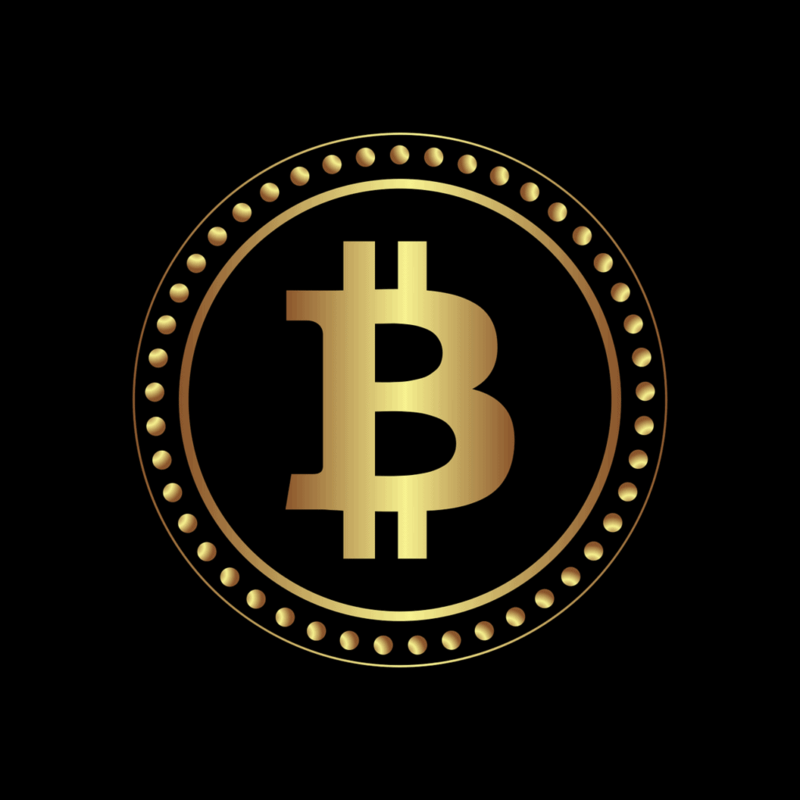 As BTC is widely accepted as a base currency at different cryptocurrency exchanges, you can buy Bitcoin Gold with Bitcoin. This comes handy at times especially when you have a BTC balance that you seek to exchange to BTG. Let us show you how you can do that on Binance. Firstly, create an account at the cryptocurrency exchange. Set up 2FA, then head to the deposit area and send BTC into your Binance wallet. When your funds have arrived, head to the trading platform of the exchange. Choose Bitcoin from one of the four base currencies and find the BTG/BTC trading pair. Select the amount of coins you wish to purchase, your order type, and execute the trade. For more information on how to buy Bitcoin Gold on Binance, read back to find our step-by-step guide. After BTG’s price has gone up to a limit where you are satisfied, you may choose to sell the coin for profits. But how and where can you sell Bitcoin Gold? Let us tell you the where first, the cryptocurrency exchange Binance. And now let’s see our brief tutorial on selling the coin on the service. Firstly, you need to create an account at the cryptocurrency exchange. When you are done, you need to set up 2FA as soon as possible to protect your coins. If you are ready with that, head to the deposits section and select Bitcoin Gold. 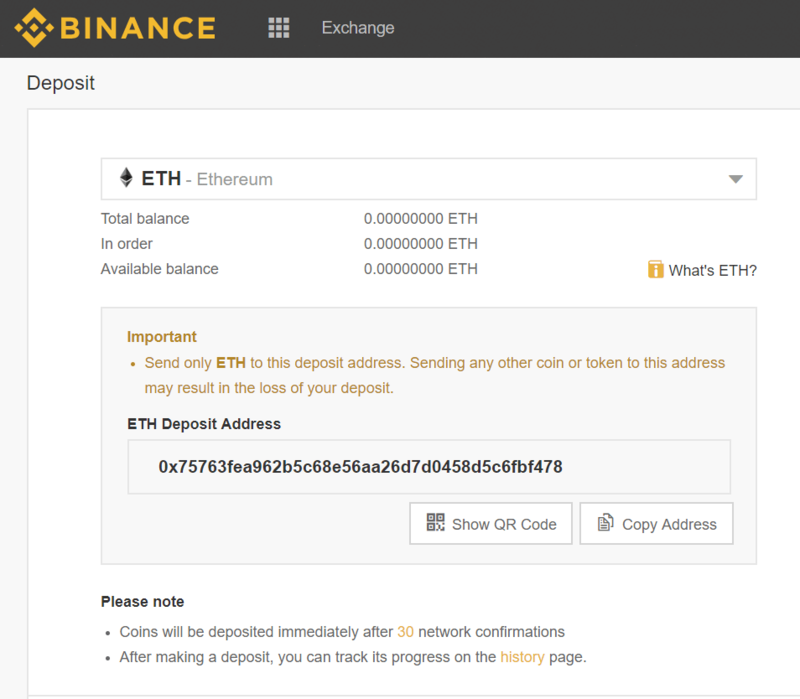 Use the wallet address shown on the page to send coins to your Binance wallet. When your BTG has arrived, head to the trading page. Choose your preferred coin from the four base currencies (BTC, ETH, BNB, and stablecoins), then select the relevant BTG trading pair. Set the amount and order type, then execute the trade. So we have shown you the best services you can use to buy Bitcoin Gold. You also know that credit card transfers are fast, but a bit expensive and owning BTG on your wallet has its downsides and upsides. Unfortunately, you can’t buy Bitcoin Gold with PayPal. Now, it’s your time to choose the service and the payment method you want to use to buy BTG. We recommend Binance as it is a trusted cryptocurrency exchange featuring a wide variety of coins as well as high limits without verification. Subscribe to our newsletter to receive Bitcoin Gold news and more articles like this! Bitcoin vs Bitcoin Gold: what’s the difference? The main difference between Bitcoin and Bitcoin Gold lies in the two cryptocurrency’s mining algorithms. While Bitcoin has SHA-256, BTG uses the ASIC-resistant Equihash algorithm. Does it say anything to you? No? Then let us explain with a little background story. As Bitcoin has become more and more popular, a surging number of miners have joined the network to support the coin’s system while making profits in the meantime. Different companies have realized that BTC mining was quite profitable if they have outsourced their operations to a location where electricity is cheap. Moreover, as they have used a low-electricity location, they have made significant profits that they have re-invested to buy more mining rigs. Throughout multiple years, these companies have grown large and become mining giants. The organizations add up to a huge percent of the network’s hash rate. Individual miners only have a small share of the Bitcoin network’s hash power. And possessing a large percentage of the hash rate means power for the companies. If there’s a debate in the community over different upgrades (among other things), these organizations are the ones who are deciding which option to choose. Unfortunately, individual miners don’t have the power to decide in the case of a quarrel. Therefore, critics are saying that Bitcoin mining is rather centralized, which is not what the coin’s creator Satoshi Nakamoto has envisioned. And here comes Bitcoin Gold in the picture. The founders of the coin wanted to create a cryptocurrency where the mining is decentralized. Bitcoin Gold is using the Equihash algorithm, which is resistant to ASIC mining rigs. Instead of ASIC mining, BTG users are able to use their GPUs. Furthermore, Bitcoin Gold has a new difficulty adjustment with every block compared to Bitcoin’s difficulty adjustment update in about every second week. There’s also another difference when comparing Bitcoin vs Bitcoin Gold, and this is replay protection. Let us explain first what a replay attack is. Playback or replay attack is a network attack in which hackers repeat or delay valid data transmission maliciously. The replay attack can be carried out by either the originator or an external attacker who intercepts the data and re-transmits it. Obviously, replay protection is a security measure that prevents such an attack from happening. This security measure is critical during a cryptocurrency hard fork. Therefore, the creators of Bitcoin Gold has activated replay protection. On the other hand, the Bitcoin network is not protected against replay attacks. What is ASIC mining and why it is important in Bitcoin Gold’s case? ASIC stands for Application-specific integrated circuit. While this may do not say anything to you, ASIC is a powerful cryptocurrency mining hardware that is over a million times better at mining coins than an average desktop computer. At first glance, this could mean a great thing for digital currencies. However, ASIC mining rigs are really expensive. While individual users are able to buy one or a couple of ASICs, their mining operations won’t be very profitable unless they have (legal) access to low-cost electricity. Just compare this to large mining companies who are running thousands of ASICs in low-cost countries and warehouses. Individual miners are unable to compete with them. As it becomes more and more harder for the average user to mine Bitcoin – as the more expensive mining becomes, the fewer persons will be able actually to do it -, the mining network will become increasingly centralized. So, ASIC mining is related to Bitcoin Gold as the developers of the cryptocurrency implemented an algorithm that is resistant to ASIC chips. This algorithm is called Equihash. The motto of the coin is “Make Bitcoin Decentralized Again” (a modified version of Donald Trump’s election campaign slogan). Therefore, the developers have set a goal to create a network where everyone can use a simple computer to mine the cryptocurrency while making profits in the meantime. While this creates a more decentralized mining network for Bitcoin Gold, this was also the vision of Satoshi Nakamoto – one computer, one vote. Bitcoin Gold mining: is it worth it? Mining Bitcoin Gold along with other cryptocurrencies are the best worth when the market is uptrending. However, if you have access to relatively cheap electricity, and you have a budget to spend on mining rigs, you can go for mining BTG even in a crypto market that just crashed. However, we can’t give you a precise answer on whether it is worth it for you to mine Bitcoin Gold as mining profitability matters on different factors. The first factor is the initial cost of your mining rig. Fortunately, as Bitcoin Gold is using the Equihash algorithm to make mining more decentralized, you won’t have to spend a fortune on your equipment. You only need one or a couple of high-performing GPUs. Secondly, you should be aware of the hash power as well as the performance of your GPU(s). And finally, costs like electricity should be taken into account as it will determine how much profits will you be able to take home at the end of the month (or year). As mentioned before, you should also be aware of the price of the cryptocurrency you are mining (Bitcoin Gold in the current case). I want to keep my coins as safe as possible. What is the most secure Bitcoin Gold wallet? Security is a crucial factor when you are holding coins in a cryptocurrency wallet. Unfortunately, hackers are highly targeting the crypto space. They have one ultimate goal: to steal as much digital currency as possible from the users. But fear no more. If you set up a few security measures (like 2FA) and/or you choose a high-security wallet, you don’t have to worry about your coins being stolen by attackers. Now let’s see what type of wallets and the actual products are the most secure for storing Bitcoin Gold. Hardware wallets are considered as the most secure cryptocurrency wallets by experts. These solutions come with a physical device. This device is used every time to enter a PIN by the user when you are logging into your wallet and when you try to send an outgoing transaction. As no transactions can be sent from your wallet without you entering a PIN on the physical device, military-grade protection is created. Let’s see a case when a hacker tries to steal your funds from your hardware wallet. He has to first breach the software side of the wallet. However, that is not enough to transfer your funds to his wallet. The attacker has to acquire your PIN and your physical device (to enter the PIN). While this is not completely impossible, the hacker has to be a mastermind – one of the best in the world – to steal funds from your hardware wallet. And in case he or she is successful, it becomes a question whether it was worth for him or her as such attack requires really hard “work.” So, the most secure Bitcoin Gold wallet solutions are hardware wallets. And, fortunately, all of the big, trusted brands – including Ledger, Trezor, and KeepKey – are supporting BTG. What’s your Bitcoin Gold price prediction for 2019? In the short and mid terms, we can’t provide you with a Bitcoin Gold price prediction for 2019. And, honestly, no one can, including expert traders and investor legends. The reason for that is that cryptocurrencies – including Bitcoin Gold – can become highly volatile at times. They can increase their prices by 10% in an hour, then go down by the same percentage in the next hour or so. What we know is, however, that cryptocurrencies like Bitcoin Gold will stay us in the long term. As there will be more use-cases for coins, the more people will buy them and/or use them in their everyday lives. If more people are buying BTG, the cryptocurrency’s price will likely increase. How can I buy Bitcoin Gold anonymously? A part of the cryptocurrency community prefers not to provide any Know Your Customer (KYC) or Anti-Money Laundering (AML) documents to the service providers when they are purchasing coins on their services. However, most of the companies in the space have to comply with different regulations. Therefore, they are requesting KYC and/or AML documents in addition to other information from their customers. So, here comes the question: how can you buy Bitcoin Gold anonymously? Despite the strict regulations, there are ways to buy BTG without providing any documents to anybody. The first method is to use a cryptocurrency exchange – where BTG is supported – that has high account limits. Therefore, you don’t have to verify your account and submit KYC and AML documents in order to buy the coin. Two good examples of such services are Binance and Changelly. The other way is to buy Bitcoin Gold locally using a service (or a seller) that does not require the aforementioned documents from you. If you have an ATM nearby that supports BTG or you can connect with a local seller, you have a good chance to buy Bitcoin Gold anonymously. How can I buy Bitcoin Gold with cash? While using a credit card to buy BTG serves as a convenient solution to purchase the coin, a part of the people prefer to use cash to buy the cryptocurrency. To buy Bitcoin Gold with cash, you need to either connect with a local seller or find a crypto ATM that supports BTG nearby your location. You can also ask a friend who owns the coin to sell you some for cash. What is the best way to buy Bitcoin Gold? The best way to buy Bitcoin Gold matters on your goals and preferences. Some people prefer convenience and speed. Others want to pay as little as possible for the transaction fees. And another group of persons seeks to stay anonymous while they are purchasing their coins. We’ve collected the best ways to buy BTG for all these preferences. Now, let’s see them. If your goal is to stay as convenient as possible while your Bitcoin Gold is credited into your account quickly, buying the cryptocurrency with a credit card will be the best option for you. If you choose to pay via this payment method at the service of either a cryptocurrency exchange or a broker, your transaction will be processed within a few seconds. Therefore, your BTG will show on your account almost instantly. However, credit card transactions are usually more expensive than other payment methods, such as bank transfers and cash. On the other hand, if you need the most cost-efficient payment method, then you need to choose bank transfers – especially if you are in the EU as you will have access to SEPA transfers. While domestic bank transfers are cheap, they can take multiple working days to arrive. And most banks are not open during the weekends, so you’ll have to wait two more days if you have initiated a transfer on Friday evening. In case you want to stay anonymous, you don’t want to provide any information (or only minimal) to the service provider. The best way for that is to purchase Bitcoin Gold locally with cash or by using a service that has high initial limits for the users. No, Bitcoin Gold is certainly not a scam. As the coin has been operating over a year – in case if it was a scam -, you’d probably have read or heard it on mainstream media channels. But that’s not the case here. BTG is legit, and many people have made profits from the coin. That’s a question you have to answer for yourself. Do you have a stable financial background where you can afford high-risk investments (cryptocurrency investments are considered as high-risk due to their volatility)? Are you interested in the coin itself? Did you do a “background check” on BTG? If yes, are you satisfied with the results? If all your answers are yes, then go for it. Should I buy Bitcoin Gold this year? As no one – including us, experts, and anyone in the world – knows where BTG is headed this year, we can’t say for sure that it is a worthwhile investment to buy Bitcoin Gold this year. However, if you think so, then you may decide to buy the cryptocurrency. 2.1 How to create a Bitcoin Gold wallet? 8 How to sell Bitcoin Gold? Is it a good idea to purchase Bitcoin Gold right now or not ? Hello Adeli_r66, Bitcoin Gold has been performing much better than it was doing one month ago. The crypto market is showing signs of gains which means that BTG should also rise. However, to make sure you are investing in the right cryptocurrencies, be sure to check out this helpful article. I have a debit card and want to buy a Bitcoin Gold in the easiest way. Should I do it with a credit or debit card? Hello Emily, digital currency brokers like eToro offer multiple payment methods to their customers. You can use either a credit card or a debit card when adding funds to your account on eToro or withdrawing funds from it. Very few exchanges were offering Bitcoin Gold initially ? Hello Rebecca90, yes, Bitcoin Gold is a popular fork of Bitcoin’s open source software which took some time before getting recognized by major cryptocurrencies. Now, Bitcoin Gold is a popular cryptocurrency in the industry with a market capitalization of over $315 million. This is an awesome write-up, the last time I tried buying bitcoin, I got confused and I became discouraged. I thing I am interested in the Bitcoin Gold cryptocurrency, do you think it will be easy for me to get myself some of this as I have never tried one before? Please can you enlighten on how to buy Bitcoin Gold in Canada? Hello Chris, thank you for your appreciation. 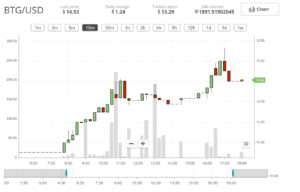 Coinbase is popularly known as a very user-friendly crypto trading platform for newcomers. This article lists the best ways to buy Bitcoin Gold along with their step-by-step instructions. Look for Coinbase sections in the article if you prefer a user-friendly method. I have been looking for a website to buy bitcoin here in The Bankok. I want to pay with iDeal but I cannot find too many of those. Do you know any others?